On Saturday, Isabel and I drove up to Centralia, WA to meet up with Timi and her friend Donna for a little girl time and antique shopping. We made it up there in no time and found Timi and Donna at "Catty Wampus" a new antique mall that had lots of great stuff, but unfortunately, pretty high prices. At least I thought so. I had been on a road trip to Centralia by myself several years ago so it was fun to see what had changed. I have to say, it is really hard for me to shop antique malls sometimes as I am really cheap and used to thrift store/garage sale prices. It was still fun to look at stuff to get ideas and inspiration. This place was called "Centralia Perk." 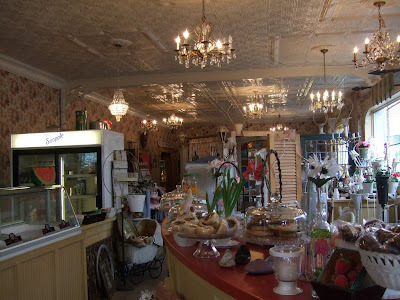 It was a coffee shop/antique shop. I loved all the cool chandeliers and the tin ceiling was to die for. I remembered it from my last visit and was so happy to see that it was still here. 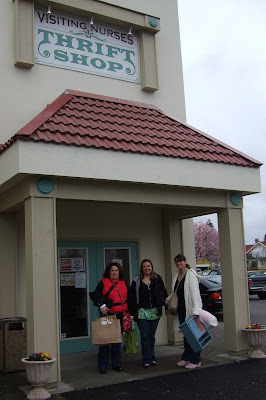 Here are the girls in front of one of the thrift stores we managed to find. I think the best part of the day, besides spending time together was the delicious lunch we had at the Centralia Antique Mall. I wish I had taken a picture of it as it was so pretty. Tomato Basil Soup and Sandwich with Turkey, Avocado, Bacon and Lettuce. Yummy! 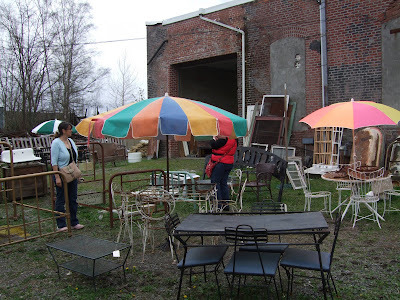 We did find several antique shops including a neat architectural salvage shop that had lots of cool stuff. Isabel found some neat things there to bring home. You can check it out here. Finally it was time to drop Timi and Donna off at the train station (they had rode down from Seattle) and head home. It was a really fun day and we are already talking about going back up there to check out the shops in Timi's town of Snohomish. Here's a picture of the loot I scored on our trip. 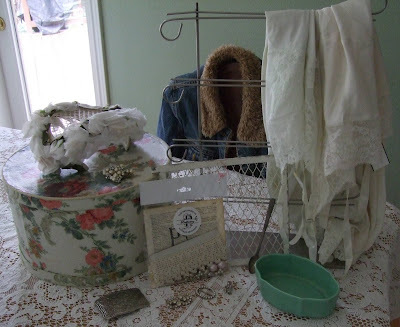 Floral hat box, rose covered hat, metal display stand, two lacy slips, bag of lace and misc. beads, green pottery planter, baby spoon, rhinestone buckle, two rhinestone pins, belt buckle and denim jacket with furry inside. Here's a close up of the little stuff. 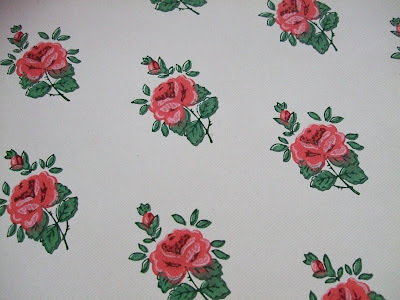 And Isabel was sweet enough to share some of this yummy vintage wallpaper with me. I just love it! Still working on projects for farm chicks. Hopefully I'll be able to show a few completed ones on my next post. 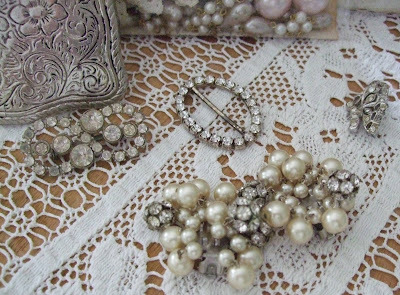 great finds, I love treasure hunting! Wow you really scored. Great finds. Great finds and what a fun day...nothing better than hanging out with the girls doing some shopping. I am on the same page as you with prices too...spoiled from estate sale and thrift store prices...hard to pay a higher price unless it is something I fall in love with! I just love the idea of riding a train to go junking and may I add that anything with avocado on it just has to be yumo! You and Isabella can sure ferret out the best stuff. What a GREAT place you found. The lunch menu made me want to jump into the car and drive..um, 1000s of mile - never mind. You found some great finds. Can't wait to see what you come up with for the Farm Chicks show. You sound and look like a girl after my own heart! I am also a Washington gal. I sort of know Timi but not in person yet. She and I still have to get together one of these days! Fun blog, love seeing all your travels. Stop in my blog sometime. I ran away on Saturday too, took me a trip to Anacortes , WA. next time you gilrs are up this way, come visit me at my house! I'll make you tea and lunch! love to see you again! forgot to ask, did you go to catty wompus? it's great! I'm like you. Spoiled to cheap prices. I don't do shops well. Even though I have one. But I'm sorry. People like their stuff way too much. I try to keep my prices down. I'd rather sell it than sit on it. Wish other folks would think like that. I might buy more. I can only assume they don't know how to find the bargains and are paying to much in the first place. Wonderful goodies! I love the rhinestone pins and belt buckle. And can you believe -- I HAVE that exact green pottery piece! Aren't fun days made even better with good friends?! I love the jewellery, wallpaper & jewellery!!! What beautiful finds. You have an eye for beautiful things. Oh I just love reading where all you have been shopping. I especially liked when you found some broadcloth in Vernonia. My daughter lives in Vernonia Oregon. That shop is gone now i think. I use to go once a year. I will be in Portland this July for the expo and I am looking for all your oregon Bloggers. WOW I love your blog.. I am going to be a regular on here.. I will add you to my blog roll. Thanks for sharing. I LOVE the name of Catty Wampus! I hear ya though...sometimes it isn't easy to pay the higher prices when you KNOW that there are better bargains out there in this big world of ours. woohoo you went to some great places,wish they were here in Australia.They are just the kind of magical places to go arent they !